Classical but mandatory I’ll talk about social and big data in further articles. The first will describe how retrieving live tweets and store them in HDFS. A Flume event is defined as a unit of data flow having a byte payload and an optional set of string attributes. A Flume agent is a (JVM) process that hosts the components through which events flow from an external source to the next destination (hop). A Flume data flow is made up of five main components: Events, Sources, Channels, Sinks, and Agents. An event is the basic unit of data that is moved using Flume. It is similar to a message in JMS and is generally small. It is made up of headers and a byte-array body. The source receives the event from some external entity and stores it in a channel. The source must understand the type of event that is sent to it: an Avro event requires an Avro source. A channel is an internal passive store with certain specific characteristics. An in-memory channel, for example, can move events very quickly, but does not provide persistence. A file based channel provides persistence. A source stores an event in the channel where it stays until it is consumed by a sink. This temporary storage allows source and sink to run asynchronously. The sink removes the event from the channel and forwards it on either to a destination, like HDFS, or to another agent/dataflow. The sink must output an event that is appropriate to the destination. An agent is the container for a Flume data flow. It is any physical JVM running Flume. The same agent can run multiple sources, sinks, and channels. A particular data flow path is set up through the configuration process. Before any configuration, you have to declare a twitter application. Three concepts come with big data : structured, semi structured and unstructured data. For geeks and developpers (not the same things ^^) Structured data is very banal. It concerns all data which can be stored in database SQL in table with rows and columns. They have relationnal key and can be easily mapped into pre-designed fields. Today, those datas are the most processed in development and the simpliest way to manage informations. But structured datas represent only 5 to 10% of all informatics datas. So let’s introduce semi structured data. Examples of semi-structured : CSV but XML and JSON documents are semi structured documents, NoSQL databases are considered as semi structured. But as Structured data, semi structured data represents a few parts of data (5 to 10%) so the last data type is the strong one : unstructured data. Unstructured data represent around 80% of data. It often include text and multimedia content. Examples include e-mail messages, word processing documents, videos, photos, audio files, presentations, webpages and many other kinds of business documents. Note that while these sorts of files may have an internal structure, they are still considered « unstructured » because the data they contain doesn’t fit neatly in a database. Satellite images: This includes weather data or the data that the government captures in its satellite surveillance imagery. Just think about Google Earth, and you get the picture. The unstructured data growing quickiest than the other, and their exploitation could help in business decision. Announcement: MABS August 2014 Update is now live! Microsoft Azure BizTalk Services August 2014 Update is now live! We are pleased to announce the August 2014 update of Microsoft Azure BizTalk Services and the associated SDK. The release provides ability to configure and manage agreements and bridges separately, new features for EDI, enhanced encryption for AS2, supports advanced XML schema constructs in transforms and is Drummond certified. While these features are immediately available in any new BizTalk services you create, existing services will be upgraded over in next few days. There would be no impact to availability of existing services as we roll out the upgrade. There are no pricing changes with this announcement. You can now change settings in a bridge (transforms, transport settings …) without having to redeploy the corresponding agreement. Additionally one bridge can now cater to multiple agreements. Agreements and bridges can be configured and managed separately enabling reuse of configurations and ease of management. When sending messages to a B2B partner via an agreement you could use only one pair of delimiters for that partner. With this release Azure BizTalk Services allows configuration of delimiter set per message type on the outbound side. This is applicable for both X12 and EDIFACT protocols. Acknowledgements generated during receive side processing can also choose to use the delimiter set of the incoming message for which they were generated. We are happy to announce that with this release Azure BizTalk Services is now AS2 Drummond Certified. See the same being announced by the Drummond Group here and here. All advanced XML schema constructs used in complex schemes, including derived types (xs:extension and xs:restriction types), are now fully supported in Transforms. These derived types are typically used in OAGIS, Salesforce and GJXDM schemas. When you create links from elements under a “derived type” node in the Source schema, that link is only executed when the “xsi:type” value in the input XML instance matches the type value for that specific node. For “derived type” node in the Target schema, the correct “xsi:type” is stamped automatically in the output XML instance based on the incoming mapping links. Following is the list of the XML schema constructs that are newly supported. Windows Server 2012 R2, Windows Server 2012, Windows 8.1, Windows 7 SP1. Microsoft Office Excel 2013 or 2010. WCF-WebHttp adapter now supports sending and receiving JSON messages. Provides capability to include free-text data as part of the message that can be processed by the HL7 pipelines. 64-bit support for hosting Hl7 adapter. I’m starting a new series of blog post around no-sql. Why did I choose the domain ? Because, I think that the future will pass by No-SQL, and that evereybody talks about big data. So before talking about big data, for me, I think it is essential to first talk about No-SQL. As we can seen it, SQL and No-SQL cohabit in database environment and give an answer to differents issues. You cannot simply forget SQL system for using No-SQL. OK got it, but what is hidden behind the terme NO-SQL ? A NoSQL or Not Only SQL database provides a mechanism for storage and retrieval of data that is modeled in means other than the tabular relations used in relational databases. Motivations for this approach include simplicity of design, horizontal scaling and finer control over availability. The data structure (e.g. key-value, graph, or document) differs from the RDBMS, and therefore some operations are faster in NoSQL and some in RDBMS. There are differences though and the particular suitability of a given NoSQL DB depends on the problem to be solved (e.g. does the solution use graph algorithms?). The appearance of mature NoSQL databases has reduced the rationale for Java content repository (JCR) implementations. NoSQL databases are finding significant and growing industry use in big data and real-time web applications. NoSQL systems are also referred to as « Not only SQL » to emphasize that they may in fact allow SQL-like query languages to be used. 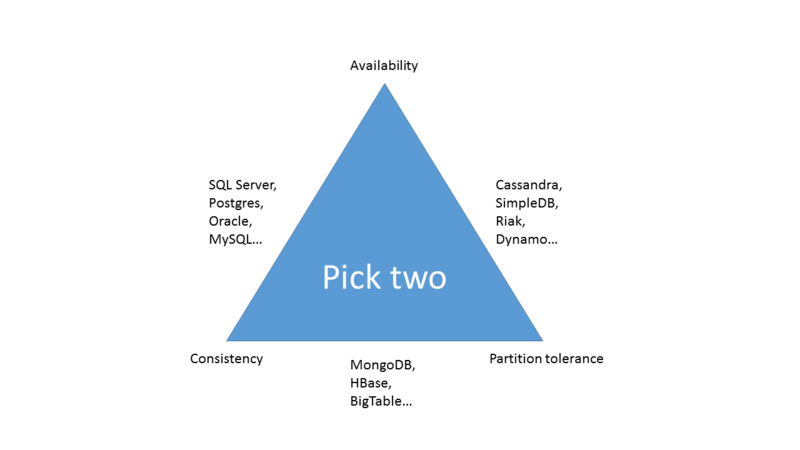 Many NoSQL stores compromise consistency (in the sense of the CAP theorem) in favor of availability and partition tolerance. Barriers to the greater adoption of NoSQL stores include the use of low-level query languages, the lack of standardized interfaces, and the huge investments already made in SQL by enterprises. Most NoSQL stores lack true ACID transactions, although a few recent systems, such as FairCom c-treeACE, Google Spanner and FoundationDB, have made them central to their designs. Remember the CAP theorem, No-SQL only gives two different combinaisons relative to SGDB. In fact, No-SQL offers some very interesting properties like response time on very large volume (we talk about peta octet), and there is neither schema problem nor data type. On the opposite side, there is neither join operator nor agregation, you need to do this in your code. On the web, you find lot of comparison between SQL and No-SQL systems. For me, that doesn’t make any sense because they don’t work on the same segment. It’s like adding cabbage and carrots. The only significant possible comparison is about volume, and it’s sure that SQL manages the lowest volume. But everyone agrees with me to say that the volum is only one side of database system problematics. For a developed tabular click here. Extension method are not well know but they are very powerfull. This article is not a tutorial with extension method but an inventory around it. Extension method must be use only for technical issues never for business requirement. As I said previously, extensions are designed for technicals cases. The extension’s code shall not exceed ten or twenty lines. In Visual Studio, I recommend to store extensions in one project dedicated. This project can be referenced in each artifact. Moreover, you can manage your extensions near your client project, in fact String.SpliintParts method should be the same in your client A and your client B, so manage your extensions in your own project.